Good morning flowers - I hope that you all had a splendid weekend and that Monday morning isn't being too hard on you!! Last night I decided to treat myself to a long soak before throwing myself into a busy week at work. 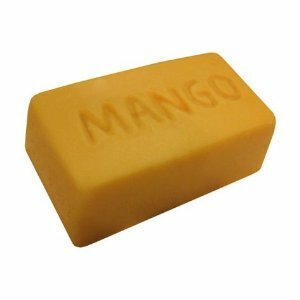 I grabbed my favourite luxury bath melt from Lush - the delicious "You've Been Mangoed" - and the book I'm reading, and off I popped. This product is a favourite of mine for several reasons... firstly, the mango butter is super moisturising. I have dry skin on my body (and oily on my face... worst combination!!) and I always step out of the bath feeling soft and silky! Second of all, this product contains a generous amount of lemongrass oil, which tones your skin big time! It also (supposedly) leaves you in a good mood, due to the citrus scent (maybe that's just me... big citrus fan right here!!!). Lastly, it smells DIVINE... literally mouthwatering - one of my favourite Lush scents ever!! The only downsides to this product are the lack of bubbles (they just make baths more fun... right?) and the semi-grey tint it gives to your bath water, which not exactly enticing!! However, f you can get over these (minor) issues, you will bloomin' love this luxurious, delicious bath melt. Susan Tinsley (c) 2010. Simple theme. Powered by Blogger.